Song of the day: Bert Kaempfert – "Afrikaan Beat"
The brass! The strings! The plink-plink bass guitar! The ultra-relaxed drums! Magnificent. By the way, this very track was selected ages ago (July last year) by the estimable Frank (Hi, Frank!) as one of Frank’s Faves on Fridays, which was a regular feature here for a while. I like Frank’s taste in music. And I love the music of Bert Kaempfert. Hooray! A song I’m familiar with. I’m also well-acquainted with the album it appears on (Kon Tiki), but I must be one of the few power pop fans who doesn’t like the album much. I know that it’s adored by critics and power pop connoisseurs, and is regularly mentioned in lists of “lost” or “unknown” power pop classics, but I’ve always found myself annoyed by various aspects of the album. For a start, I don’t think the songs are particularly strong (i.e., not very well written, and not having great or memorable melodies). And I find a lot of the production ‘touches’ annoying. For example, one of the tracks, “Private Ruth”, has a whole lot of stuff going on in it that does nothing to enhance the song. It only succeeds in irritating me. And “Vegetable Row” has some weird delay effect put on the vocals before the chorus (starting at 1:09) that are pointless. And one more thing: why the panning vocals on the album’s last track, “Autumn’s Birds”? All these vocal oddities lead me to my biggest annoyance about the album: the vocals themselves. I find them irksome. There’s a nasal and lazy quality to them that sounds deliberate to me, and I think that’s the most bothersome thing about them: I have a feeling that the singer meant to sing in a nasal and lazy way, in an attempt to sound like John Lennon. The most prominent example of his singing ‘style’ is in “Aurora Bori Alice”. Just the start of that song gives me the heebee jeebies. I’ve listened to Kon Tiki five times now, but it hasn’t gotten any better with each listen. But you didn’t suggest today’s track, “My Before And After”, just so I could moan about Kon Tiki. I’ll get back to “My Before And After”. The good news about “My Before And After” is that I think it’s probably the second best song on the album (the best being the opening track “Camp Hill Radio Operator”, and the third best being “Lily Dreams On”). The bad news is that it still has that nasal and lazy (“nasalazy”?) quality in the vocals. And one last thing before I move on to the next song: throughout “My Before And After” there’s a strange background sound that appears seemingly at random that I find distracting. It sounds like a yelp. I hope this doesn’t look like I’m obsessed about it (it probably will), but… I’ve just analysed the track, and the ‘yelp’ (or whatever it is) occurs every four seconds (0:02, 0:06, 0:10, 0:14, but then at 0:19, 0:23, 0:27, 0:31, then at 0:36, 0:40, 0:44, 0:48 – and then I gave up). Are these people trying to do my head in? Did someone in the studio decide to deliberately put a bizarre sound on the track every four seconds? (I guess they did, because it doesn’t happen randomly.) Do I feel brave enough to contact Cotton Mather and ask them? Does any of this matter? At all? The guitar intro got me thinking that it might be an 80’s song. Then the drums started and confirmed it. As far as the vocals go, I didn’t like how the vocal melody just sang the guitar part, and I wasn’t a fan of the lyrics (I actually winced at the line “Cos you ain’t worth the salt in my tears”). For me, the song was yet another you-done-me-wrong ditty that wasn’t out of the ordinary in any way. I think I’ve heard enough songs about a poor rock star hurt by ‘his woman’ to last me a lifetime. And I’ve certainly heard enough mid-tempo 80’s rock songs to last me even longer. But keep sending them – there may be one I like. (It’s possible.) About the only thing I did like in “The Salt In My Tears” was the middle eight – it had a few nice chord choices (I liked his use of diminished chords). But that’s about it. And here’s another song about a poor rock star hurt by ‘his woman’. (See above.) At least in this song she’s come back to him – but he’s fightin’ that feelin’ because he’s been hurt by her before… etc. It’s also another song I’m familiar with. It’s the opening track on The Galaxies’ 2008 album, Here We Go!. For me, the song is OK. Not great, just OK. The album’s fairly consistent (no one song is better than the other), so I reckon you could have chosen any other song from it. But I don’t think it’s a great album. (As hinted at earlier, I think it’s OK.) Now, I don’t know why – it could be the instrumentation, or maybe the singing – but when I listen to the album I think it sounds like either a roots rock band playing power pop or a power pop band playing roots rock. But I’d say that anyone who likes “Here We Go Again” will like the album. That’s a really weird saxophone solo. Great stuff. This came on after Edwin Starr’s soulful effort, and when it started I laughed out loud. I’ve always loved cheesy instrumental music (my parents were James Last fans), and I can almost always go for anything in the (much-maligned, but not by me) “easy-listening” category. In “Afrikaan Beat”, I like how the brass section was divided into two and played independent parts (trombone on the left, flugelhorn on the right). Overall, though, it’s another superb example of easy-listening-ness. There’s an equally superb video of Bert performing “Afrikaan Beat” on YouTube. Love it. 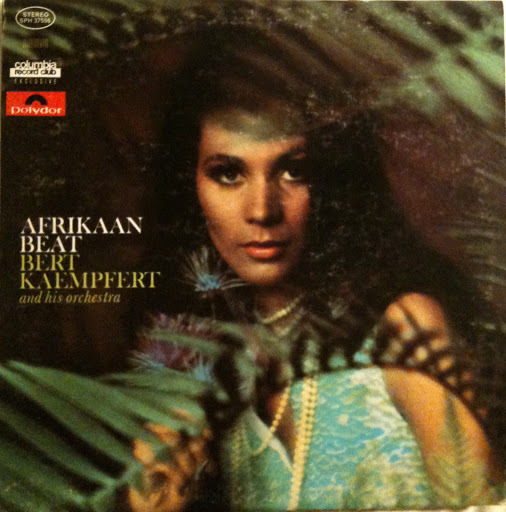 Hearing “Afrikaan Beat” instantly put in me in the mood to listen to a whole lot more from Bert, but I’ve just found to my horror that I don’t have any Bert Kaempfert in my music collection. (That situation will be rectified shortly.) For the time being, I’m consoling myself with Rhinestone Cowboy: The Best Of Glen Campbell. You are currently browsing the archives for the Bert Kaempfert category.